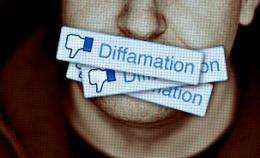 (PhysOrg.com) -- Defamation is becoming a huge issue on social media sites as lawsuits for this particular offence are rising dramatically. In Canada and the US, 15 percent of all Web 2.0 rulings were on defamation cases. In France, its 49 percent and in Quebec its more than 10 percent. Other infractions committed in cyberspace that are processed by our legal system include pedocriminality, harassment and threats, and privacy breaches. These results are taken from the second phase of an extensive research project on Web 2.0 criminal activity. The project is lead by Benoit Dupont, director of the International Centre for Comparative Criminology, and Vincent Gautrais who holds the Université de Montréal Chair in e-security and e-business law. These results were obtained following the analysis of 400 rulings from everywhere around the world. The rulings studied by Dupont and Gautrais highlight, to varying degrees, the colossal challenge to legally pursue defamation on the web. The case of Louise Major, the ex-mayor of Rawdon, is a fine example of that. In 2008, Ms. Major filed a lawsuit against the owner of a public forum in which citizens made defamatory remarks about her. An interim interlocutory injunction forced the website to close until a ruling was rendered. A few months later, a Superior Court judge ruled in her favor. In 2010, the Quebec Court of Appeal annulled the decision by stating that liberty of expression is to democracy what oxygen is to the human body: essential. The cost of the process for the town of Rawdon was approximately $600,000. Closing the website was perhaps not the best way to resolve the lawsuit. Eradicating the abusive comments would have been sufficient. This case illustrates how the judicial process can be arduous, expensive and lengthy. Its not always the best tool to contain such behavior. Its like using a canon to kill a fly, believes Gautrais who instead promotes the education of the citizens of tomorrow. I advocate for the creation of a technology 101 course in high school where teenagers learn that social networks are public spaces and where, for instance, they are taught to block harassment on Facebook, says Gautrais who has been using social media as a teaching tool for many years. People say things to or about each other online that in person would tend to get someone hospitalized. You can tell something about a person's maturity by how they comment about others online - especially those they disagree with.